Tell us a little about yourself: what is your first name, how old are you, and what is your favorite flavor of ice cream? My name is Ellie, and I’m 13 years old. My favorite kind of ice cream is mint chocolate chip. What book did you read and why did you choose it? 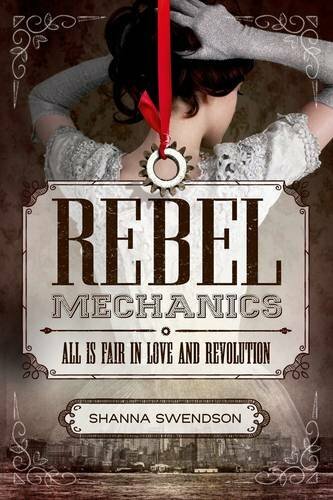 I read Rebel Mechanics by Shanna Swendson. I like to read historical fiction, so I figured I’d check it out. Can you describe this book in one word? Detailed. What was your favorite part of this story? When Verity, the main character, stood up for herself when Alec tricked her. If you had a problem similar to the main character's problem, what would you do? If I was half magister I would probably try to lay low and not have joined the rebels. What would you say to your best friend to convince them to read this book? I would tell her that it was staged in 1888 and a romance because she loves those books. What do you think about the book's cover? It looks very steampunk and I like how there are several pictures overlapped. Would you want to read another book about these characters? Why or why not? I have just started the sequel because I have to know what happens. Can you name another book that reminds you of this one? The Darkest Hour by Caroline Tung Richmond also has girl spies and is set during WWII. If you could ask the author one question about this book what would it be? Where did the name magisters come from? Ellie, Ms. Swendson has answered your question below. I really don’t have a definitive answer for where “magisters” comes from. It just sort of popped into my head as what to call a person who uses magic, and it was similar to “magistrate,” so it also gave a sense of someone who had authority. Only later did I learn that it was a real word that means “scholar” or someone qualified to teach in a medieval university. Which still kind of fits the idea of someone who can do magic, especially since the word “magistery” is related to alchemy. Thank you, Ms. Swendson and Ellie! You can read more about Rebel Mechanics here.